pool water chemistry is a big topic, so we will start with the goal of ideal swimming pool water chemistry results. Our goal is to see ideal chemical levels at our next pool service visit. We want to see 2.0 to 3.0 ppm of free, available chlorine, 7.2 to 7.6 pH, and 80 ppm to 120 ppm of carbonate alkalinity. Notice we mentioned carbonate alkalinity not total alkalinity! Most test kits have a little blue cap and green cap solution vial along with a bigger white cap solution. This test measures total alkalinity and we have to subtract our cyanuric alkalinity to gain that carbonate alkalinity result. Without conditioner, it is very hard to hold enough chlorine in pool water. 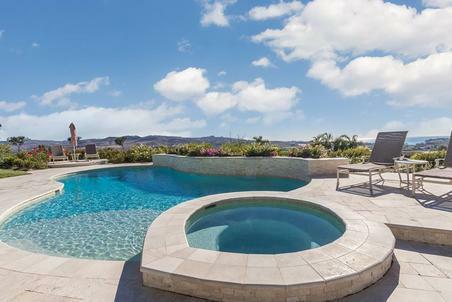 Green, cloudy pools can be a sign of no chlorine. First thing to test for is conditioner if you keep getting low to zero readings on your conditioner levels. Cyanuric alkalinity is the alkalinity from cyanuric acid in the water. Cyanuric acid is pool conditioner which bonds to chlorine in the pool water to keep the chlorine sanitizer from stripping out of the water. Chlorine sanitizer will strip out of the pool water from the sun, bodies in the water, and debris. The more the sanitizer is in demand to sanitize the pool water, the faster it will diminish. Pool conditioner or cyanuric acid holds chlorine sanitizer in the pool water for longer durations. We want between 50ppm and 80 ppm of conditioner in the pool water and if it is low or non-existent, you will notice that you have to add a lot more chlorine sanitizer than you should have to. Free, available chlorine will not hold in the water and cloudy, green pools are a result of unsanitized swimming pool water. To simplify cyanuric alkalinity, it is easiest to just know that when the conditioner level (cyanuric acid) is over 80ppm to 100ppm, there is enough cyanuric alkalinity to create aggressive pool water and you need to balance this. The rule of thumb is to try and keep your pool conditioner under 80 ppm which is why we switch from tablet chlorine to liquid chlorine as soon as possible (weather depending) after summer until as late as possible before summer. Remember that chlorine tabs contain pool conditioner and will add more pool conditioner (cyanuric alkalinity) to your pool which may already have elevated levels. 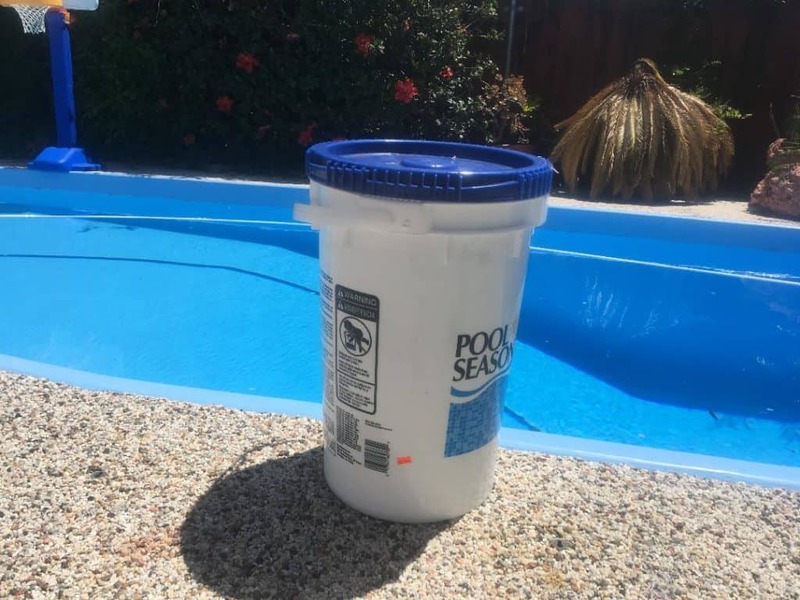 This is pretty complicated, so we will move on and you can click to learn more about more about the relevance of pool conditioner in your swimming pool water chemistry. This is difficult to manage in hot climate zones where tablet form chlorine is necessary and used heavily for most of the year. 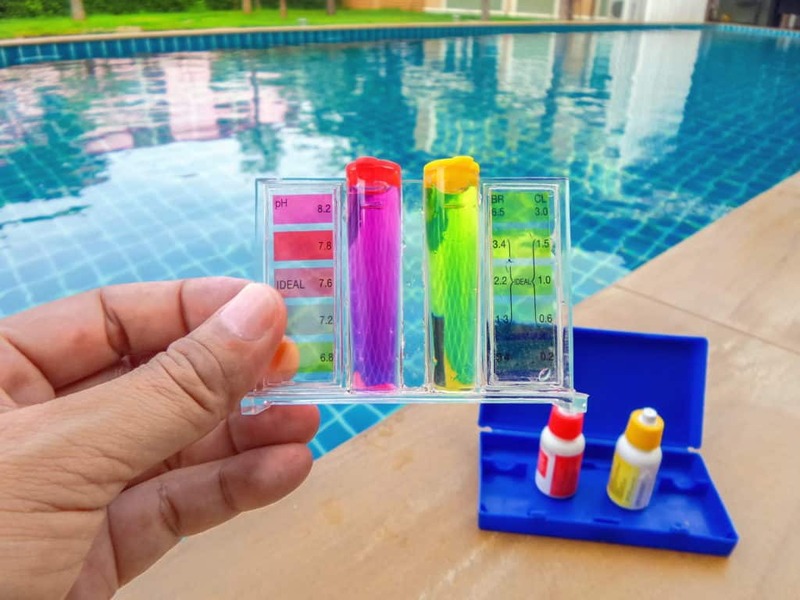 Now that we know a little about pool conditioner and the cyanuric alkalinity it adds to your swimming pool water chemistry, let’s look at some other pool chemicals. We add chlorine nearly every service visit and we aim to add enough to test for 2.0 to 3.0 ppm of available chlorine on our next swimming pool service visit. Chlorine demand is stronger in the summer with warmer weather and more use and the trick is to know how much to add. This takes experience and expertise. 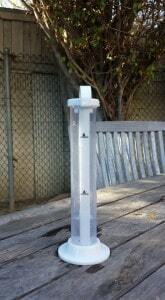 We also know that the chlorine we add will affect the total alkalinity and pH that we test for. During the swimming season, tablet form chlorine has an advantage, because it dissolves slowly without dramatically spiking up chlorine levels. 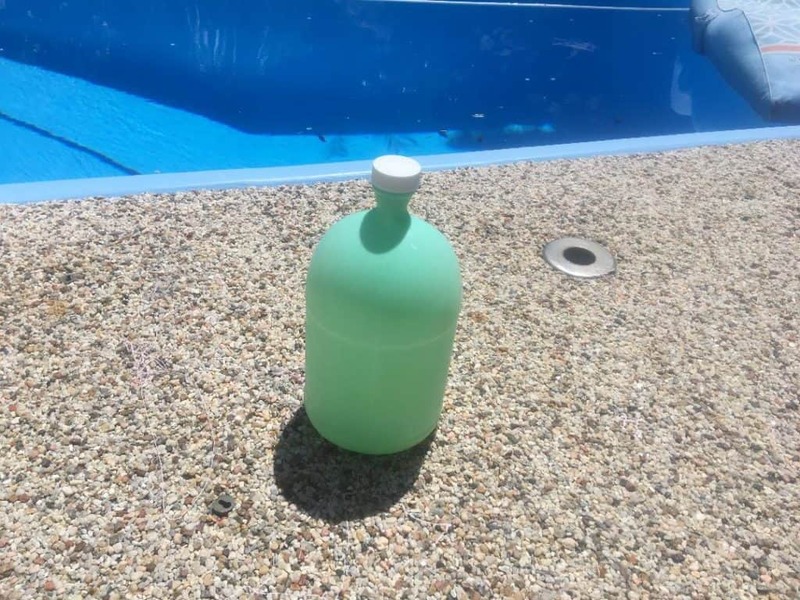 You can read more about how the different forms of chlorine sanitizer effect swimming pool water chemistry in our section on that topic highlighted. We change different forms of chlorine we add to our swimming pools to keep and hold perfect swimming pool water chemistry. Expertise in swimming pool water chemistry is necessary for perfect pool water chemistry. Every chemical you add to your pool water will affect the swimming pool water chemistry. We know what ideal levels are, so scroll through our other informative swimming pool topics on swimming pool water chemistry to learn more. Newport Beach Pool Water Chemistry, Huntington Beach Pool Water Chemistry, Costa Mesa Pool Water Chemistry, Irvine Pool Water Chemistry, Fountain Valley Pool Water Chemistry, Santa Ana Pool Water Chemistry, Garden Grove Pool Water Chemistry, Orange Pool Water Chemistry, Tustin Pool Water Chemistry, Villa Park Pool Water Chemistry, Orange Pool Water Chemistry, and Newport Coast Pool Water Chemistry.